You may have absently-mindedly wandered onto this page. Maybe you’re wondering who I am ? Well my name is Stephen John MARCH. Here is a photo of me outside the C13th templar church at Bourbonne les Bains. Should you want to find out a little more then there is a website that tells our story and has our quarterly prayer / news letters going back to when it all began. I’m just an ordinary Christian guy – husband, father, would-be theologian, wannabe author, amateur guitarist etc. I was born in England, grew up in Scotland, now living in France – so pretty mixed-up! These ‘fuel for pilgrims’ blogs have been developed into book format, each volume containing 40 individual meditations with reflection questions and suggested prayer responses. Ideally people would do a set of studies individually and then meet together to share what they had learned, been challenged by, found interesting, and then they could pray together. The 40 day format makes it suitable for use in Lent or Advent. (To purchase click on the cover images and it will take you to lulu.com where the books are heavily discounted, you can buy them from other online retailers, but they are more expensive there. The books are also available in all the eBook formats and can be bought from the device specific vendor sites, or in epub format from lulu). 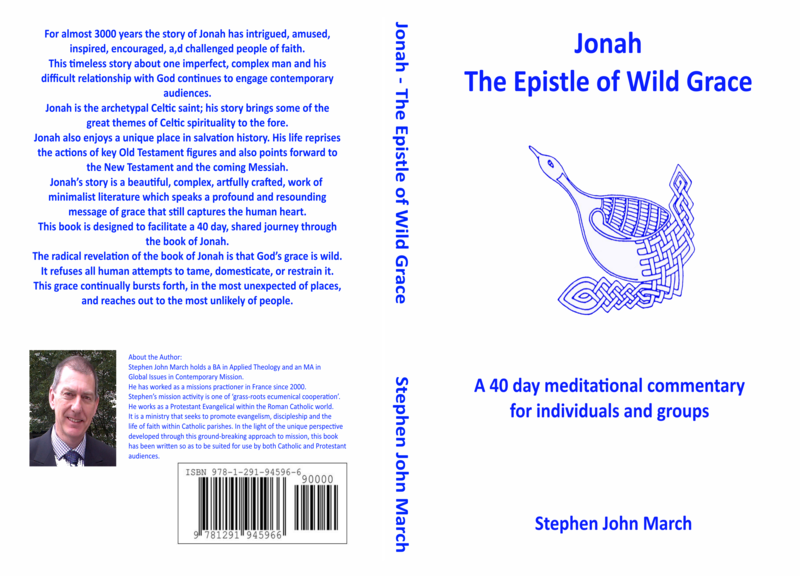 I have also published ‘Jonah – the epistle of wild grace’ which is a 40 day meditative commentary on the book of Jonah, designed for individual and group use. Again, ideal for a Lenten or Advent course and designed to get people excited about the Old Testament. In this book I explore the amazing message of the book of Jonah – the unbelievable extent of God’s amazing grace. I also examine the remarkable preparation of both Jonah and his audience by God, in order that Jonah’s mission succeeds. A preparation that is so powerful that even Jonah’s rebellion and flight only serve to better prepare him for his mission. A preparation that includes God placing certain elements into the pagan mythology of the Ninevites thousands of years previously, all to facilitate the success of Jonah’s mission! This book is available via lulu.com or all the online retailers in hardback, paperback and e-book format. This book is also available in French as “Jonas – L’Épître de la Grâce Déchaînée”. I previously co-authored ‘As Pilgrims Progress – Learning how Christians can walk hand in hand when they don’t see eye to eye’ – snappy title, I know. It is just about to be released in hardback and eBook formats, to complement the paperback original. (These new versions are already available on http://www.lulu.com). You might want to read if – at least if you think it might be good if Christians could learn to get along and work together even when they come from different traditions – crazy idea, I know. After 14 years in a voluntary ministry of ecumenical, grass-roots cooperation in a Catholic parish in France my wife and I feel God may be about to move us on elsewhere. Prayers for clear guidance would be appreciated! My wife and I survive partly through paid work and partly through financial support from those who believe our crazy idea is from God. If you would like to support us then our website http://www.marchsite.com will let you contact us and we can send you details of ways to do that. Stephen, I just wanted to thank you for researching the author of the “Disturb us Lord” prayer. I’d felt it was too modern for the era although I appreciate it greatly. You’re welcome Steven. It is a great and powerful prayer. May God bless you! I’m doing a bit of Sacramental research and came across the article entitled A Theology of Sacraments. In the article Mona mentions Augustine at one time holding that 304 sacraments existed. I quoted that number to an acquaintance with whom I’m having a heated dialog and shame on me I did it before researching the source. You commented on the article and requested the source for the 304 number. Looks like Mona could not come up with it. I’m wondering if you were able to corroborate the number and if so could you reveal your source material? I live in the Philadelphia area USA. My neice is home for a month or so for a visit. She decided to move to Strasbourg about 2 years ago and looks like she’ll be there for a while longer. Forgot to check off the Notify box….and will now remedy my omission.